A sunroom is meant to extend the outdoor livability of an open patio area in spring and fall, to keep out insects, and to provide a lovely, relaxing area for enjoyment and entertaining. 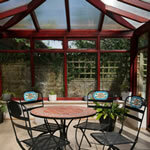 Your new sunroom can be rectangular or bowed, and can have shed, peaked, domed or curved roofs. 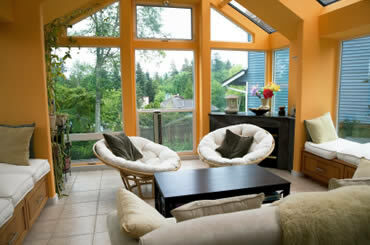 It can be a kit or a new or existing stick-built room with big, bright multi-paned windows. They can range from a 6 x 9' kit with acrylic panels for under $2,000, to palatial three-season rooms costing $20,000 to $30,000 and up. It is also possible to get a DIY kit. Lightweight sunrooms don't bear snow loads as well as those with heavy, durable structural elements, but may be perfect in mild climates. Learn more about materials, structure and designs from our helpful articles and images. 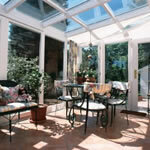 You can also find leads to local dealers and installers for your new sunroom. Start here to add sunshine to your life.